Part of the kingdom of Offaly in ancient Ireland, was known as King’s County from 1556 until the Irish Free State was established in 1922. County Offaly, with its castles, abbeys, and heritage centers, lies near the center of Ireland. There are numerous places of historical interest throughout the county, including one of the most important early monastic sites in Ireland – Clonmacnoise, burial place of Rory O’Connor the last High King of Ireland. The heathery Slieve Bloom Mountains, in the southeast of Offaly, are ideal for walking and hiking, boasting open moors and hidden valleys just waiting to be explored. The River Shannon separates Offaly from Galway and Roscommon in the west of the county. 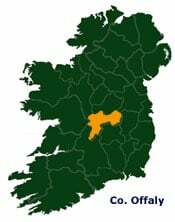 It flows along most of the western border of Offaly and has an area of 1,997 sq km and the Slieve Bloom Mountains rise to 518 m (1700 ft) in the southwest. The Bog of Allen covers the northeast. Dried peat is produced here. Often compressed into briquettes, it is used in many European countries, particularly Ireland, as a fuel. It is not as efficient as coal because of its large content of water and ash. Farming is the chief occupation, with wheat and barley being the dominant crops.